HomeElectronicsComputers and AccessoriesLaptop AccessoriesStandsJaeilPLM Projector, Laptop Stand. Universal, Height Adjustable Multipurpose Heavy Duty Floor Tripod 21″ – 38″. Portable Holder Tray. Great for DJ Equipment, Studio, Stage, Home Theater, Office. MULTIFUNCTIONAL STAND: The projector stand is multifunctional and will work well as a “multipurpose” product. 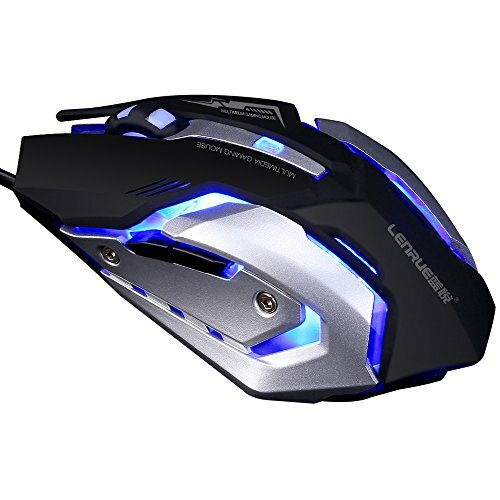 It is made for laptops, computers, and projectors, but it will also work well with DJ equipments, books, presentations, etc. Use it anywhere such as home theaters, offices, studios, stages, business meetings, classrooms, etc. SAFETY FEATURES: The holder tray is 15.25 x 11.25 inches. It features raised border edges to prevent your electronic devices from accidentally falling. It also features holes for easy wiring organization of your laptops, projectors, etc. to prevent you from tripping on wires. The holes also make it easy to move the projector stand around. It comes with 2 elastic bands to hold your devices down. Be ensured with these safety features and protect your high dollar electronic devices safely. Are you looking for a projector stand for home theaters or offices? It’s not just for projectors. This multifunctional tripod stand is made for laptops, computers, and projectors, but it will also work well with DJ equipments, books, presentations, etc. Use it anywhere such as home theaters, offices, studios, stages, business meetings, classrooms, etc. It features multiple safety features such as raised border edges, holes for wiring organization, and elastic bands. Be ensured with these safety features and protect your high dollar electronic devices safely. The projector stand can easily be set up without the requirement of any tools. 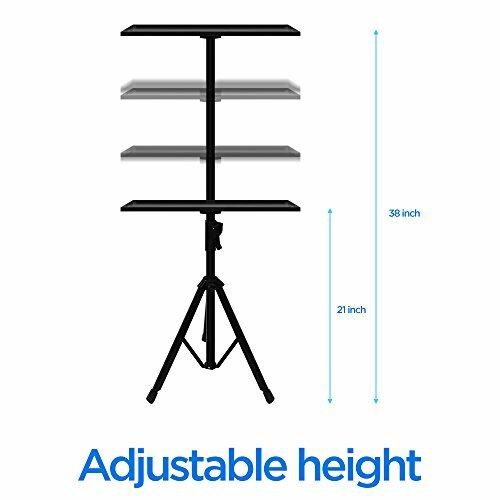 The projector stand can be adjusted to any height between 21 to 38 inches. It’s perfect for adjusting the viewing height while watching movies, presentations in business meetings, etc. JaeilPLM projector stand comes with a holder tray, tripod stand, and two elastic bands. 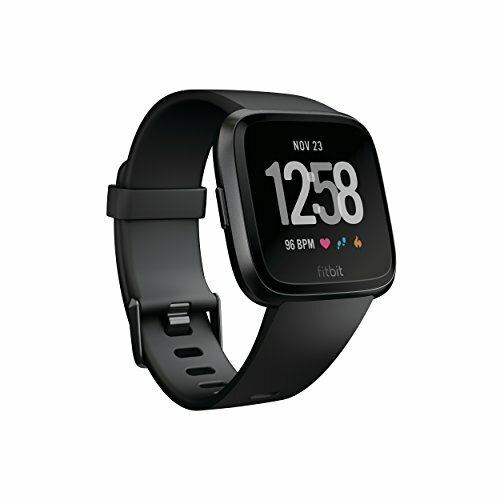 Compact and lightweight design makes it portable and easy to use anywhere. 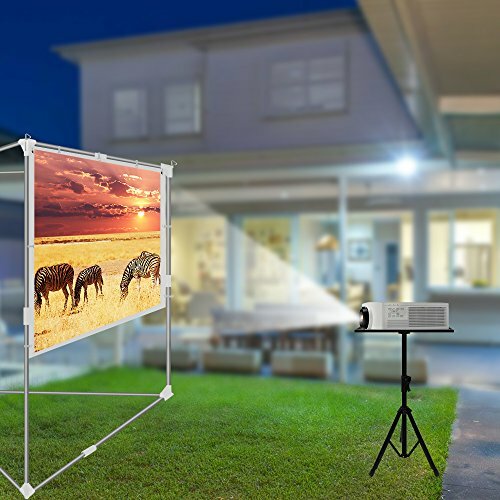 PORTABLE & EASY TO SET UP: The projector stand can easily be set up without the requirement of any tools. 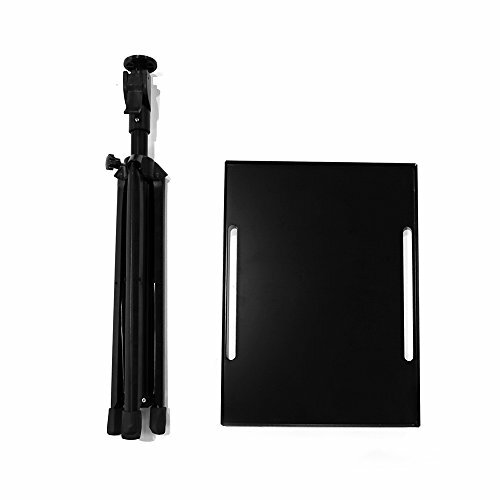 Simply twist the holder tray on the tripod stand, then adjust the height to your need. 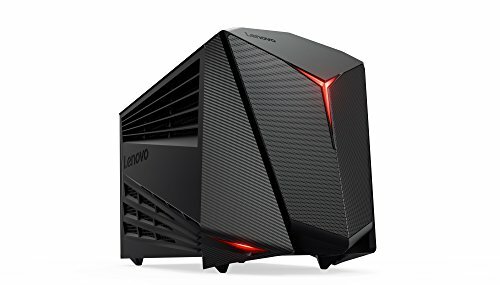 It’s also very portable. Untwist the holder tray, adjust the height back down, then fold the tripod to make it easy to carry around anywhere. 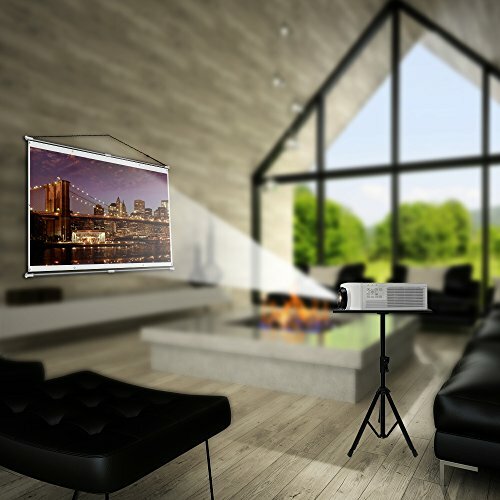 ADJUSTABLE HEIGHT: The projector stand can be adjusted to any height between 21 to 38 inches. It’s perfect for adjusting the viewing height while watching movies, presentations in business meetings, etc. 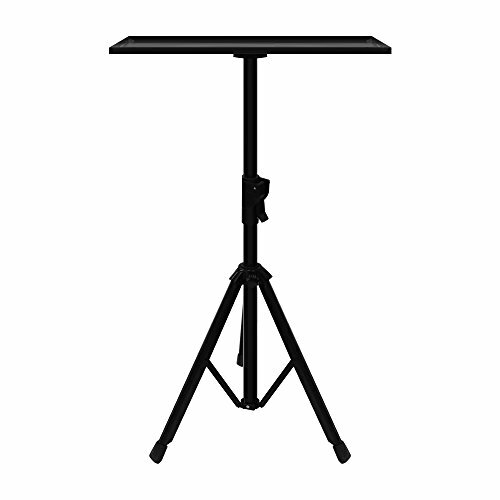 INCLUDES: JaeilPLM projector stand comes with a holder tray, tripod stand, and two elastic bands. 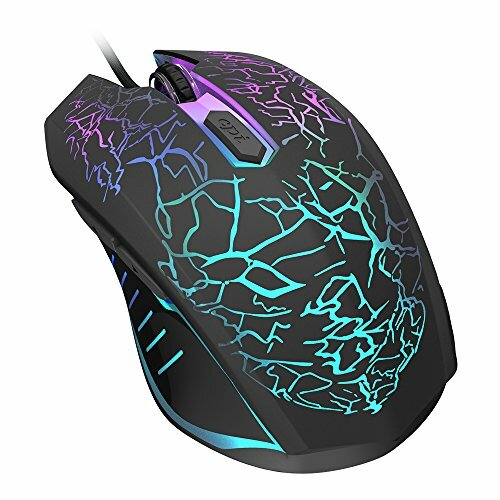 Compact and lightweight design makes it portable and easy to use anywhere. 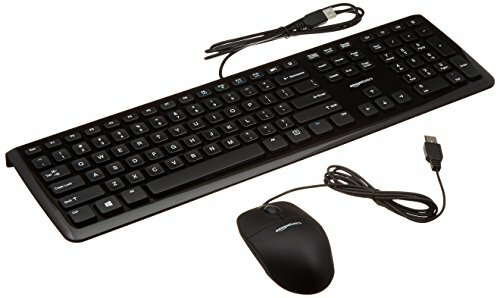 It’s a must have for home theaters, offices, studios, and stages. Specification: JaeilPLM Projector, Laptop Stand. Universal, Height Adjustable Multipurpose Heavy Duty Floor Tripod 21″ – 38″. Portable Holder Tray. Great for DJ Equipment, Studio, Stage, Home Theater, Office.